AAI(Airports Authority of India) recently make some changes in education qualification requirement for Junior Executive ATC post. Full time regular Bachelor’s Degree in Engineering / Technology in the disciplines of Electronics / Telecommunications / Information Technology. B.Sc. with Physics & Mathematics. Minimum Percentage in Graduation : Minimum 60% or equivalent. Full time regular Bachelor’s Degree in Engineering / Technology in any discipline. These changes will be implemented in Advt. No. – 07/2015. 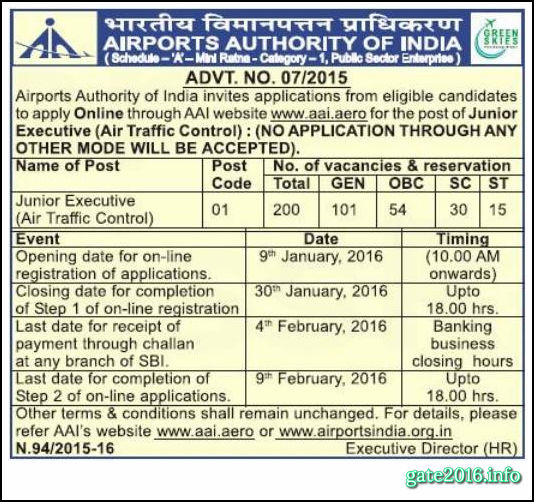 AAI will recruit 200 Junior Executive ATC through Advt. No. – 07/2015. Online application from filling for Advt. No. – 07/2015 will start from January 9, 2016. Earlier candidates with Bachelor’s Degree in Engineering / Technology in the disciplines of Electronics / Telecommunications / Information Technology were allow only for JE ATC post now candidates with any discipline of Engineering / Technology allowed like Aerospace Engineering, Instrumentation Engineering, Civil Engineering, Mechanical Engineering, Electronics and Communication Engineering, Mining Engineering, Chemical Engineering, Metallurgical Engineering, Production and Industrial Engineering, Computer Science, Information Technology, Electrical Engineering etc. 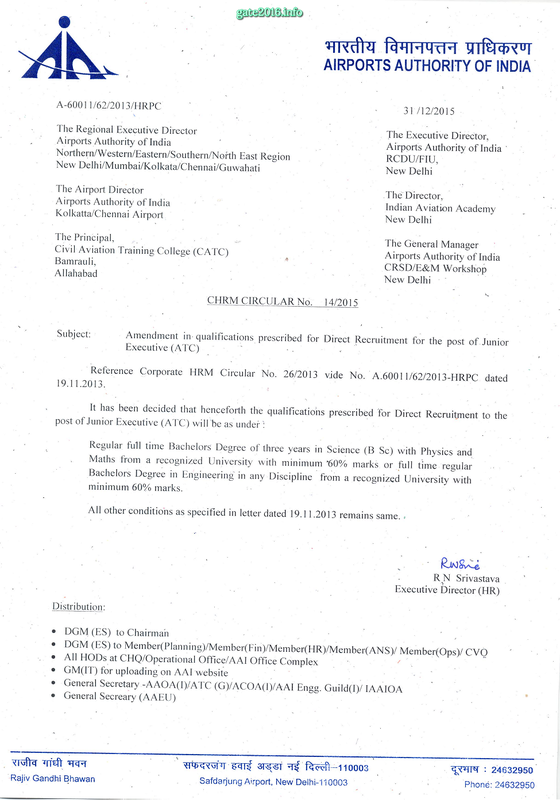 Are candidates presently studying in their final year of B.tech eligible to apply for Junior Executive ATC post ? will the final year students in B.E be eligible for applying for the post of junior executive in AAI recruitment 2016 air traffic control?